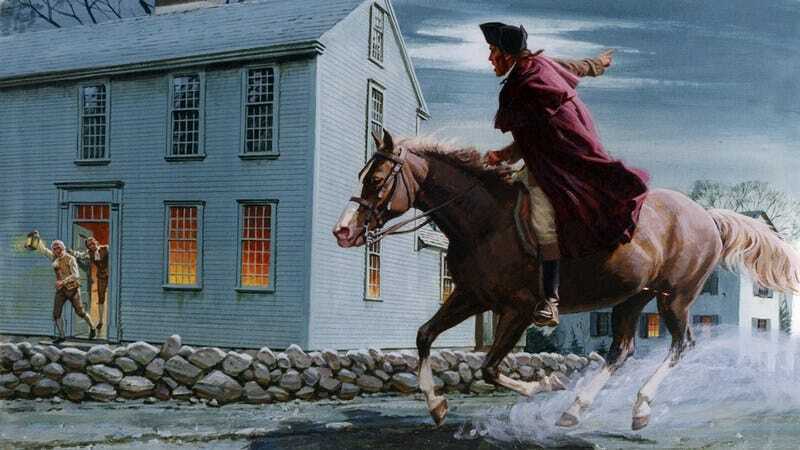 On April 18, 1775, Paul Revere rode on horseback from Boston to Lexington, warning American patriots of the coming British army. Unfortunately, he was forced to kill six people that night because they were shouting so loudly about how much they loved salsa that they were completely drowning out his warnings about the British. Paul Revere was riding through Charlestown shouting, “The British are coming!” when he came across a man on horseback who was shouting about how much he loved salsa. That man was Samuel Wescott. Wescott was yelling about how he had ridden all the way from New York to shout at people about how salsa was so good that he wanted to put it in a bowl. Revere begged Wescott to quiet down for just a second so he could deliver his warning about the British, but Wescott didn’t even hear him because he was screaming, “Salsa is salad, and it’s also sauce! I have to tell everybody about that!” Left with no other option, Revere was forced to pull him off his horse and drown him in Boston Harbor, with Wescott screaming odes to salsa even as his lungs filled with seawater. Paul Revere eventually came upon a father and son who were riding at a breakneck pace toward Lexington. The son, Ephraim Lancaster Jr., was yelling at his father about how he couldn’t wait for him to die so that he could inherit all his terrific salsa. Revere knew that if he wanted to have any chance of warning the boy’s father about the British, he had no choice but to kill the boy right then and there. So Paul Revere chopped off Ephraim Lancaster Jr.’s head and quietly informed his father that the British were coming. But Revere’s warning was immediately interrupted by the joyful ululations of Ephraim Lancaster Sr., who shouted, “I was on my way to Lexington to give my son up for adoption because he wasn’t filled with mild salsa, but now I don’t have to do that because he’s dead! I love Paul Revere almost as much as I love salsa!” Paul Revere then blew up Ephraim Sr. with a stick of dynamite and rode away into the night, muttering under his breath about the British. Paul Revere arrived in Medford just after Leonard Fairchild, who had just invented the megaphone in order to speak significantly louder about how much he loved salsa and was riding around the countryside shouting at people about it. “I call this thing the Salsa Device, and it is going to completely change the way we shout about how salsa just completely blows relish out of the water in terms of flavor, texture, and versatility!” Fairchild screamed into his megaphone, entirely overpowering the sound of Paul Revere’s voice desperately warning the townspeople of the incoming British soldiers. “Me-oh-my-oh, pico de gallo!” Fairchild added, as Paul Revere threw him and his megaphone into a wood chipper, showering the townspeople in viscera and plastic. “The British are coming,” Revere said to the blood-soaked crowd. They nodded, and he continued on his way. When Paul Revere arrived in Lexington, he was relieved to find John Adams, Thomas Jefferson, and George Washington waiting to receive his message. But before he could tell them anything, a euphoric Benjamin Franklin shot out of the woods on a bike, screaming, “I found salsa in the woods!” Paul Revere executed Franklin on the spot by shooting a cannon at his head, but it was too late. John Adams, Thomas Jefferson, and George Washington had already run off to go look for salsa in the woods. Revere shouted after them, “The British are coming! The British are coming!” But John Adams just shouted back, “Who even cares about that at all when there’s free salsa in the woods?” and continued running away. Having completed his journey, Paul Revere rolled Benjamin Franklin’s body into the river and went back home to Boston. The legend of his incredible patriotic mission lives on to this day.